No matter your place on the political spectrum, it is undeniable passage of the Republican-led tax reform measure was a monumental feat. A similar undertaking hadn’t been seen in Washington, D.C., in more than three decades. For proponents of greater funding for infrastructure, the law marked somewhat of a victory in that the tax exemption for private activity bonds was included. “We are pleased with Congress’ decision to keep the tax preferred status for private activity bonds in the final version of the tax overhaul bill. These bonds are used to finance important infrastructure projects such as airports and toll roads, and are essential to ensuring passengers don’t bear even more burdens,” said Marcia Hale, president of infrastructure advocate Building America’s Future. However, Hale and many other stakeholders expressed disappointment the tax overhaul did not include a long-term fix for the Highway Trust Fund. By relying on shrinking revenue from federal fuel taxes, the trust fund is headed toward insolvency in a few years. Aside from taxes, the year gave us a glimpse of what autonomous technology could mean for the trucking industry, a mandate on landmark truck-safety regulation, and a robust debate on infrastructure funding. Below we highlight our favorite news items from Capitol Agenda in 2017. 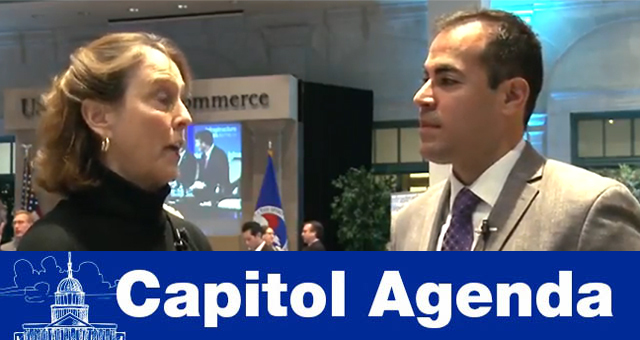 NOTE: Capitol Agenda will return Jan. 8. ELDs: Commercial vehicle inspectors will issue citations to motor carriers operating vehicles without electronic logging devices beginning Dec. 18 but will not place vehicles out of service until April 1. CONNECTED VEHICLES: DOT’s wireless connected vehicle pilot program, currently in its design, deployment and testing phase, is making progress at its demonstration sites in Wyoming, New York City and Tampa, Fla., the program’s manager told members of an agency advisory committee. DAIMLER: Daimler AG announced it is taking steps to separate its Daimler Trucks & Bus and Mercedes-Benz Cars & Vans divisions into two legally independent and more entrepreneurial entities still under the “roof and the lead” of Daimler. Trucking and freight railroad leaders intend to press Trump administration officials for relief on certain commercial transportation regulations, The Wall Street Journal reports. For those who believe that public-private partnerships are the sun, the moon, and stars in terms of infrastructure funding, they’re going to be disappointed. Can they be part of it? Sure, especially where there’s tolling and more urban areas, more developed areas and with new construction. It’s a piece of the pie, piece of the puzzle, not the big piece. Public-private partnerships is a topic Secretary Elaine Chao is familiar with. After President Donald Trump’s address to Congress, she explained P3s to Fox News talk show host Sean Hannity. Western Pennsylvanians stick together as evidenced by House transportation panel Chairman Bill Shuster (R-Pa.), retweeting the love for the Stanley Cup champion Pittsburgh Penguins. Thanks for reading Capitol Agenda. We publish Tuesdays when Congress is in session. E-mail emulero@ttnews.com with tips. Follow us @eugenemulero and @transporttopics.